The Roche protocol recommends using only 10pg of plasmid DNA for probe labelling. As such, all three probes were diluted 1:10,000. A 1:1000 (999μL H2O + 1μL of plasmid) was made first. Then a 1:10 dilution was made (90μL H2O + 10μL from 1:1000 dilution of plasmid). Additionally, I ran half reactions to conserve kit components. Roche recommends 50μL reactions; I ran 25μL and scaled all components appropriately. All reactions were set up on ice and run in 0.2mL strip-cap PCR tubes. Go to Step 2, repeat 39 times. After the PCR, 5μL of each reaction was run on a gel. PCR DIG probe labelling products run on 1.1% agarose 1x TBE gel stained w/EtBr. A ‘+’ indicates DIG reaction, while a ‘-‘ indicates no DIG in reaction. Two reactions were run for each plasmid: one with the DIG label (indicated by a ‘+’) and one without (indicated by a ‘-‘). If the labeling was successful, the PCR products from those reactions containing DIG will be larger (i.e. migrate slower) than those without. That is exactly what we see in each of the three potential ISH targets. So, we now have three ISH probes ready for action! Will proceed with making fresh ISH buffers and ISH. Probes were transferred to 0.5mL snap cap tubes and stored in my -20C box. Set up restriction digestions to linearize the pCR2.1/RLOv plasmids in preparation for ISH probes and qPCR standard curves. Used BamHI (NEB), since it doesn’t cut in any of the RLOv sequences and cuts one time in pCR2.1-TOPO (Invitrogen). Digests were incubated at 37C for 1hr in PTC-200 thermal cycler (MJ Research); no heated lid. 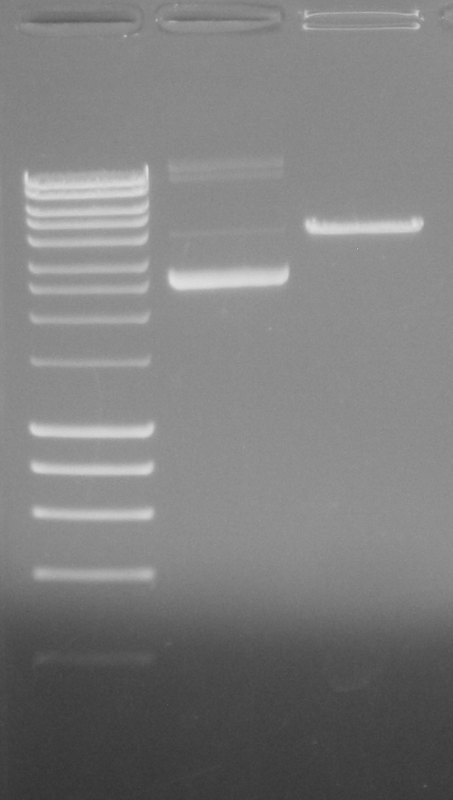 Ran 3μL of undigested plasmid and 10μL of linearized plasmid on 0.8% agarose 1x TBE gel stained w/EtBR. Besides the funky way this gel ran, the digests look to be complete. Will quantify remaining linearized plasmids with a dye-based method for accurate quantification and then proceed with the making ISH probes (membrane genes and tail fiber gene) or qPCR standard curves (DNA helicase and head-to-tail). Colony PCRs were performed on each of the three transformations from yesterday (16s, EHR, and EUB primers) using the M13F/R vector primers. Colonies were picked form the transformation plates with pipette tips, re-streaked on a secondary, gridded, numbered LBAmp50+x-gal plate and then used to inoculate the respective PCR reactions. Six white colonies (positive clones) and a single blue colony (negative clone) were selected from each transformation. Based on the PCRs used for cloning, all white colonies screened exhibit the expected product sizes. Additionally, each of the blue (negative) colonies, produced the expected band size that are indicative of an empty plasmid. Will select a positive colony from each set for mini prep and Sanger sequencing. This is an exact repeat of the PCR from yesterday, but with a brand new vial of Apex Red Master Mix, in an attempt to eliminate the contamination previously seen in the NTCs. Well, for some reason there are still bands in the NTCs. However, they appear to be of different sizes than the bands in the clam DNA samples. I think they’re OK to use and the cloning/sequencing is cheap enough these days, that I’ll just get these sequenced and see what we have. I excised each of the bands in the clam DNA samples (16s = ~2000bp; EUB = ~2100bp) and purified them using Ultrafree-DA spin columns (Millipore) in preparation for cloning. Crazy; contamination still present in the NTCs. Primer stocks were steriley reconstituted with Low TE Buffer (IDT) and working stocks were created steriley, so I’m not really sure why this is continuing to happen. Possibly the polymerase is contaminated? Will try again with previously unopened polymerase and see how that plays out. No bands were excised since I can’t be certain that the bands present in the Clam DNA samples are from the actual sample and not from the apparent contamination. Since the previous check of the various universal primers with abalone DNA (sample 09:8-20) failed to amplify, even with withering syndrome primers, I’m testing repeating that PCR using a newer/different PCR master mix. Well, this is a good result. It demonstrates that the previous reagents that I had been using are no good. The primers work. However, it does appear that all of the universal primers (excluding the 18s and EHR) are contaminated. All of these primer sets were stocks that were prepared by other people and none of them were marked as being sterile (which they should be). Regardless, I’ll re-run the Ireland clam DNA with all the primer sets and see how it turns out. In the meantime, I’ll also order new universal primer sets to replace the existing, non-sterile sets. Since the previous PCR didn’t amplify anything using four different universal 16s (prokaryote) primers, I am testing to verify that the two extractions (QIAamp Fast DNA Stool Mini Kit & the DNeasy Kit; Qiagen) actually isolated any amplifiable DNA using universal 18s (eukaryote) primers. Due to low DNA concentrations, I used 10uL of each sample in the PCRs. Samples were run in duplicate. Ladder used was Hyperladder I (Bioline). Neither sample produced any amplification. The blurry “bands” that correspond to ~100bp are likely RNA carryover from the DNA isolation procedure. They are not the amplicon we are looking for. Additionally, they are not primer dimers, as these “bands” do not appear in the NTC. I believe there is a small quantity of tissue debris in the original EtOH sample tube. I will attempt to isolate some DNA from this debris and will repeat both the 16s and 18s PCRs. Performed restriction digest using NcoI (NEB) to linearize plasmid for use as qPCR standard curve. Reactions were run for 1hr @ 37C and then heat inactivated @ 65C for 20mins. After inactivation, 5uL from the reaction was run on a 1% TBE gel to confirm digestion. 5uL of undigested plasmid was run along side the digest. The linearized plasmid (which contains a single NcoI recognition site) runs between the 5000 and 4000bp standards, which is what we expect. Will quantify and generate dilution series for use as a qPCR standard curve. Performed restriction digest on all four clones using NcoI. Reactions were run for 1hr @ 37C and then heat inactivated @ 65C for 20mins. After inactivation, 5uL from each reaction were run on a 1% TBE gel to confirm digestion. 1uL of undigested plasmid was run along side the corresponding digest. All digests are complete. 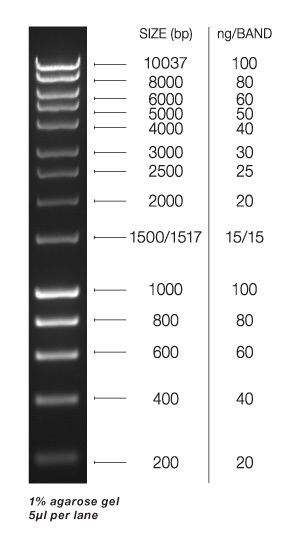 All clones reveal the same restriction digestion pattern, producing two bands: ~2500bp and ~3000bp. The band sizes total ~5500bp, which is in line (5432bp) with the full withering syndrome 16s clone in the pCR2.1 TOPO vector (Invitrogen). Will quant and prepare a dilution series for qPCR. Essentially, this is the same result as the colony check from 20120503. The appropriate sized band (~1500bp) is generated using the 16s primers, but no band is generated using the WSN primers. Yes, there is contamination present in the 16s NTC sample, but this point is moot since the WSN primers still fail to generate a PCR product. So, I have absolutely no idea what is cloned into this vector, despite the fact that primers designed on GenBank AF133090 produce a band. I’m essentially running out of ideas on what else to do to get this working again. Will ask Lisa to make a curve from the linearized plasmid stock from DATE (not the pCR2.1/AF133090 plasmid that is being tested here) and see if she can get it to work. Also, Carolyn has suggested trying to run some of the more recent curves on a different qPCR machine. Will contact the guy in Health Sciences who has a Stratagene that we are allowed to use.